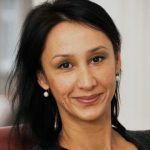 Monica Ali is a Bangladeshi-born British writer and novelist and is the author of four books: Brick Lane, Alentejo Blue, In the Kitchen and Untold Story. In 2003 she was selected as one of the “Best of Young British Novelists” by Granta magazine based on her unpublished manuscript; her debut novel, Brick Lane, was published later that year. It was shortlisted for the Man Booker Prize and was adapted as a 2007 film of the same name.